Several years ago Hubby and I went to the coast with my best friend, her cousin and boyfriend for a concert at a casino. We all shared a house for the weekend and got into a lot of fun conversations. My best friend’s cousin knows a lot about herbs and natural life and told us WAAAAY back then about Spirulina. I had never heard about it before that conversation. We asked her if you could take one thing every day for health what would it be and her answer was Spirulina. At the time my source of buying herbs and health items was only one place, Mountain Rose Herbs, which is located in Eugene, OR. They have a great website if you haven’t ever ordered from them, and they pretty much have every herb you will need. We ordered a bag of Spirulina, when we got it, it was this DARK green color, not appetizing at all. To be perfectly honest, we didn’t eat it much. In the beginning Hubby (bless his heart!) made some nasty smoothies. They were packed full of kelp and dulce and Spirulina and protein powders. His thought was they were for health and not for taste, but we didn’t keep up with them because well… they tasted like a nasty fish died in our morning smoothie. Really who wants to eat that? Now, we are in a better place. We make smoothies that taste very healthy but they also taste very good. There is a fine line to adding TOO much dried sea vegetables, trust me it’s not pretty either. So Spirulina what’s the big deal? Well when watching Food Matters I learned a lot more than I ever have. 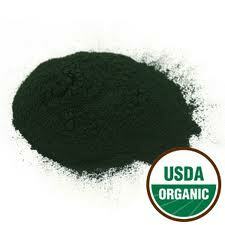 First off and what seems most important is Spirulina is the highest food protein source in the world. When you cook your food you lose up to 50% of the protein in it just by cooking it. It is packed full of vitamins and minerals here are a few: Vitamin A, B1, B2, B3, B6, B12, Vitamin C, D, and E, foltate, vitamin K, Biotin, Pantothenic Acid, Beta Carotene, calcium, manganese, iron, chromium, phosphorus, iodine, chloride, magnesium, sodium, zinc, selenium, germanium, copper, boron… that isn’t even the full list. It’s easily digestible… listen to how David Wolfe explains that in Food Matters. It’s pretty much got it all. I haven’t tried it alone, only with other algae but interestingly enough Spirulina is a fresh water algae. I just learned that today. There are tons of sources for buying yours, buy organic only though. Start having a smoothie every morning add what makes you feel good. Our morning smoothie we do very simply in our Magic Bullet: 1 Banana, 3 drops of stevia, a teaspoon of kelp, dulce, Spirulina, pea protein (any protein works), and milk. I’m a huge raw milk advocate, so we use raw milk for “animal consumption” because that is the only “legal” way to sell it in Oregon. Goat milk however is legal raw. But if you have blueberries make a blueberry smoothie, or have strawberries, or raspberry or blackberry, whatever you like and you have. 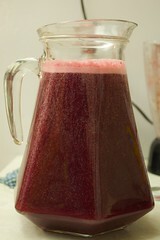 I can’t wait for the growing season this year, fresh fruit will be SO great in our smoothies this summer! Spirulina is just another proof that God gave us everything we need.